Jada left home at the age of sixteen, running from her own demons and the horrors of physical abuse inflicted by her mother's boyfriend. She partied hard, and life seemed good when she was with Born, the neighborhood kingpin whose name was synonymous with money, power, and respect. But all his love couldn't save her from a crack addiction. Jada goes from crack addict and prostitute to survivor and back again before she finds the strength to live for herself and come out on top. 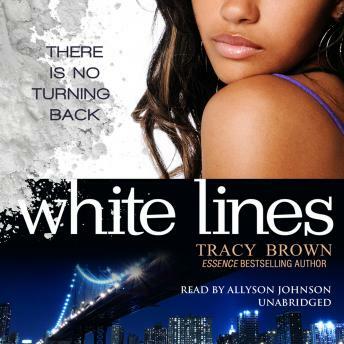 And her stormy romance with one of the fiercest hustlers on the streets makes White Lines one of the most unforgettable urban love stories of the year. This book was a good read! Can't wait to read the next one! Excellent! Worth all 19 hours of my time :-) Looking forward to reading the next installment. This was a great book. Story line was easy to follow , however the narrator was not a good fit. Ruined it for me. Major cultural disconnect. Bad choice. The book is a great read! The narrator was unaware of the pronunciation of many of the words she was reading as this is an urban fiction. Also, I had to replay many parts of the book due to the book skipping over. The book was awesome. The narrator seemed a bit disconnected at times from the culture of the script but overall a good read. This book was fire in my stl voice..lol. i had read books that were very entertaining filling my head with fantasy that in the back of my head reminded me, it's just a book and could never be real. This book gives you all of that but you can feel that this type of life can happen to anyone. The feelings between family, lovers and friends was displayed in the most realistic fashion. You felt what all the characters were feeling no matter if they were ****ing, making love, snapping on a mf, or simply going through the pains of life. The ending was perfect! Off to read part2 now.